Discover and unleash your inner potential by completing the Firewalk Instructor Training Course on the beautiful island of Bali. The Firewalk Instructor Training Course (FIT) is completed by people for numerous personal and professional reasons. It is a highly intensive and awakening course. Some complete it because they want personal or spiritual growth. Others because they wish to gain new skills to compliment their existing business working with people or start a new business. Oftentimes, there is an overlap. People always get far more than they were looking for. Who Should attend The Firewalk Instructor Training in Bali? Typical attendees on the Firewalk Instructor Training Course are Life and Business Coaches, Trainers, Consultants, Professional and Motivational Speakers, Leaders, Training Centers, Personal Development Professionals, Team Building & Adventure Facilitators. They take this course to increase their skills, knowledge and field of possibilities as professionals in Personal and Professional Development, Training and Coaching. And, they all have two things in common, a desire to be better at what they do, and a drive to help other people. Does this sound like you? If it does, we can guarantee this course will change your personal and professional life in more ways than you can imagine. What will you gain from the Firewalk Instructor Training Course? This course will change your life. You will discover more about yourself during the 6 days that you could ever imagine. You will notice increased confidence, and your family, friends, and colleagues will notice it too. Many participants will talk about feeling grounded and feeling more comfortable with themselves. On a practical level, you will leave ready to lead Firewalks, Glass Walking, Rebar Bending, Arrow Snapping, Board Breaking, and Brick Breaking. You will have the skills, knowledge, and confidence to lead these activities safely while inspiring those you work with. You will be able to guide your participants from being stuck, to moving forward. We will also help your set-up and market your business. You will also have access to the International Network of Firewalk Instructors, Continuous Professional Development opportunities and our ongoing advice and support. Who will lead the Firewalk Instructor Training in Bali? The Firewalk Instructor Training in Bali is a fully immersive, 6-day course, led by International Master Firewalk Instructor Trainers, G. Kuna and Stephen Brown. These Master Trainers have led thousands of people across the Fire; and many more through the other High Impact Empowerment Activities taught on the course. They work with many well-known multi-national companies and popular brands and have delivered events and courses all around the world. Kuna and Stephen are among the world’s leading Master Firewalk Instructor Trainers and have revolutionised many aspects of this training course. While some Firewalking Schools have reduced this course to 3-days, we have increased ours to 6. You will be on a well-structured course that maximises your time experiencing and learning these activities. We believe in empowering participants to leave this course ready to lead. Your success is our success. Bali Island is one of those spiritual places on earth that still has a rich and active Firewalking tradition. On this course, you will get to sample that tradition as well as learn the skills required to lead your own Firewalks. 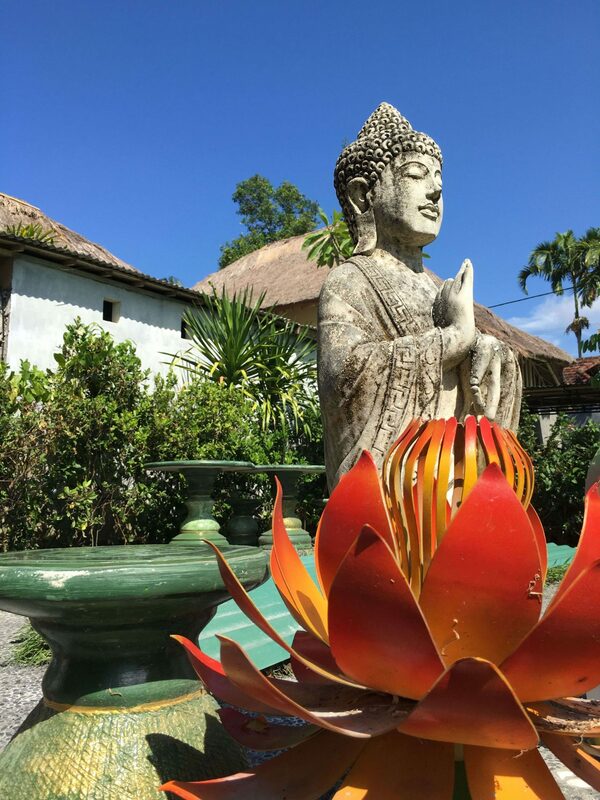 The Firewalk Instructor Training Course will be held at The Moksa Ashram, Ubud, Bali, the home of Guru Kadek Suambara, the Laughing Guru. Firewalking and Laughter Yoga are common events here, and we have the full blessing of Guru Kadek to work here. He will perform an opening ceremony for us, and his team will be supporting us throughout. The Ashram supports an orphanage and profits go towards supporting hundreds of children every year. On top of the costs associated with working at the Ashram, we have agreed a donation to support this important work. On the last day of the Firewalk Instructor Training Course in Bali, we will end with a Balinese Water Blessing ritual. A beautiful ceremony that will draw the training to a close and mark a new beginning. How much does the Firewalk Instructor Training Cost? This Firewalk Instructor Training Course costs £1500 with an early bird rate of £1200 available until 1st June 2019. A non-refundable registration fee of £400 is required to secure your place in the course. The balance to be paid on or before 31 August 2019. Instalment plans are available. The fee includes professional certification, all training, continuous professional development and coaching, and catering. We are a full-service training organization and as an International student of ours, you can enroll with full confidence knowing we will be here to assist you with support and guidance with *accommodation for your stay. * A list of accommodation facilities that are close to the training venue will be made available upon your signing up for the course. Planning to bring your family or partner with you? We can provide you with a range of further information on accommodation and excursions whilst you are at your training. If you have already completed a recognised Firewalk Instructor Training Course with us or another training provider, you are eligible to complete this course as a refresher. The early bird rate for this is £450 and is available until 1st June, when the price goes up to £750.